The bird thinks it a favor to give the fish a lift in the air. 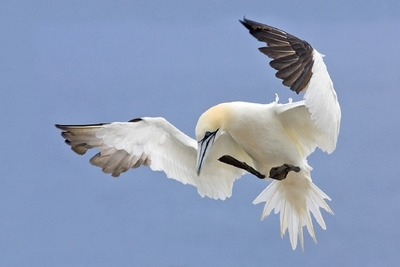 This bird (Morus bassanus, formerly Sula bassana) is a seabird and is the largest member of the gannet family, Sulidae. Breeding: Their breeding range is the North Atlantic. In the United Kingdom, these birds are a protected species. However, a legal exception is made for the inhabitants of the town of Ness (also known as Port Nis) of the Isle of Lewis who are allowed to kill up to 2,000 of them annually to serve as a traditional local delicacy. The taste is described as fishy.